Maybe you've taken a picture from the world's tallest building, at a concert or simply at the dinner table. But from space? That's a first. NASA did just that through its PhoneSat mission, a project meant to discern whether or not smartphones are capable of making the trek beyond Earth's atmosphere (they are). 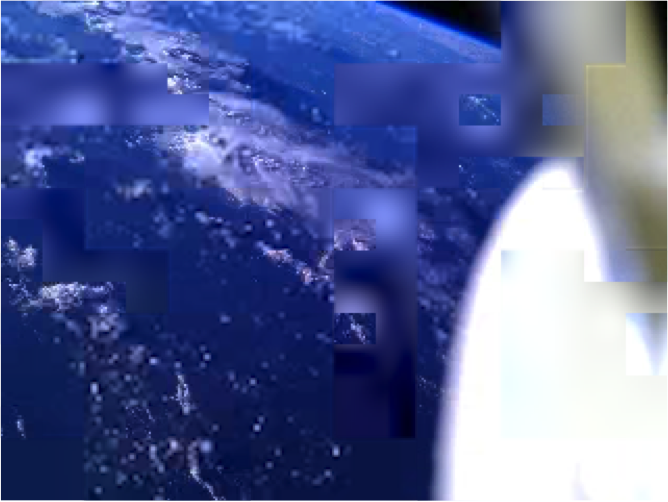 The image you see above was reconstructed from three images sent from smartphones that were previously in orbit. The goal of PhoneSat is simple: see if smartphones can be used as main flight avionics for satellites, which we first mentioned back in August of last year. NASA successfully launched the world's first smartphone-powered satellite to space in March, and we're already getting results. The fact that the three nano-satellites survived at all is noteworthy. But images are already getting pinged back. "During the short time the spacecraft were in orbit, we were able to demonstrate the smartphones' ability to act as satellites in the space environment," said Bruce Yost, the program manager for NASA's Small Satellite Technology Program. Yost said the smartphones sent back "image-data packets" to "hams," or amateur ham radio operators, on every continent (except for Antartica), which then allowed the mission to piece the image together. NASA called the successful collection of images from hams an example of Citizen Science, which is essentially crowd-sourced science; 72 hours into the mission NASA said it received over 300 data packets from hams around the globe. The mission concluded on April 27 with the PhoneSats triumphantly burning up upon re-entry into the Earth's atmosphere. The overall PhoneSat project was meant as an experiment, but NASA said the information provided valuable data for future low-cost terrestrial technologies. Yost said he believed the research could even provide enough information for citizen-space users, which could lead to even more participants of Citizen Science.